LifeTopix is all about keeping you organized, and that means giving you access to all the information you need. Because the LifeTopix My Calendar view allows you to include information from your device Calendar, you can simply and easily view all the date-related information you want. Do you need to know when the next game is for your favorite football team? There’s a calendar for that. Do you want to stay on top of every holiday? There’s a calendar for that. 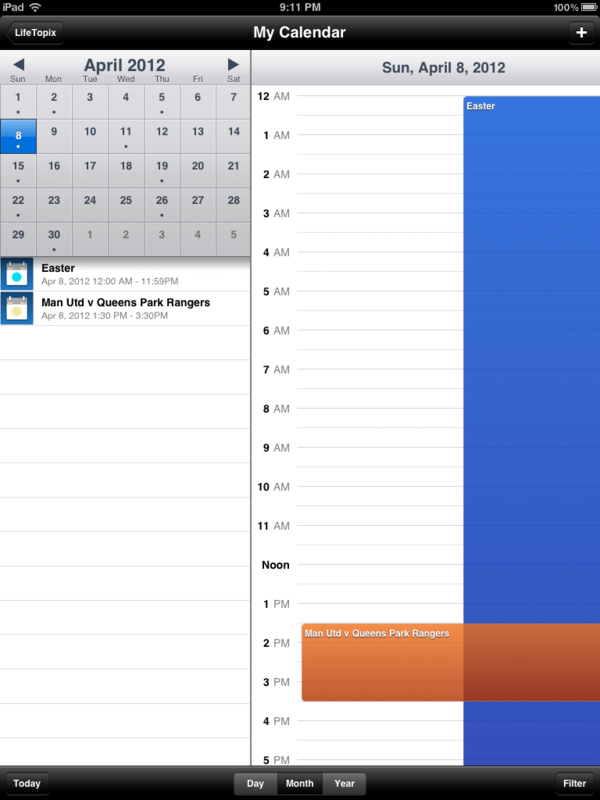 2) Next, get your desired calendar onto your iOS device. You can find the instructions for how to do that on Apple’s support site at: http://support.apple.com/kb/HT2513. You will want to click on the “Subscribe to other calendars” section and follow those instructions to subscribe to the calendar you desire. Then, click on the “Sync your calendars with iPhone, iPod, or iPad” link to get that calendar information to your iOS device. 3) Finally, make sure that the new calendar you selected is visible in your LifeTopix My Calendar. While in the LifeTopix My Calendar view, tap the Filter button, make sure “Include Device Calendar” is set to YES, then tap the > next to “Include Device Calendar” and select the calendars you want to view in LifeTopix. Keeping on top of all the important dates you care about has never been easier! Hi, Thank you for thus help. I’ve decided to anchor my calendar in google instead of iOS. My problem us that I can’t see the calendars I’ve subscribed to on google calendar in my lifetopix. Is there a workaround for this that doesn’t include subscribing on my iOS calendar? Currently if you add your Google calendar to your iOS Calendar app then items in your Google calendar will be visible in our app. And if you set your Google calendar as the default calendar in our app then when appointments are created in our app a linked copy will be created in your Google calendar as well with an alert set. Since our app works directly with the iOS Calendar app then when the Calendar syncs with your Google calendar all changes are visible in our app as well. Also, our app also syncs Google tasks when you setup Google login in Settings –> “Logins for Integrations”. Should you have any further questions, do not hesitate to contact us. Have a nice day!